When PC developers first started playing with 3D space, games like Ultima Underworld shot for the realistic motion and physics of flight sims. But I don’t think anybody ever mistook Doom for simulation, did they? Nevertheless, the Mythbusters have set out to tackle some apparently common misconceptions about the business of batting back the legions of hell with a shotgun. Mythbusters’ January 31st episode will show on Discovery in the US, and be dedicated entirely to videogames. Just wait till they find out what Gordon Freeman’s been packing all these years. id have helped the Mythbusters team recreate a Doom level. Whether it’ll be a mish-mash of Doom design or a specific, fondly-remembered Romero creation we can point to is unclear. But we do know the Mythbusters have used Doom 3, the sequel Willits led development of, for reference and not the unseen Doom 4. 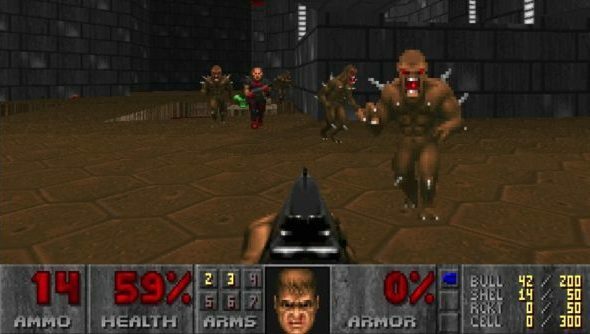 What Doom mechanics could really do with debunking? I suppose it’s dangerous to promote the idea that if you run really fast across a chasm you’ve a good chance of reaching the other side.